GoWild Affiliates feature GoWild casino which has been around for nearly 10 years operating Microgaming casino software. 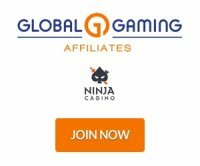 GoWild Affiliates is the casino affiliate program for Go Wild Casino. Go Wild casino is powered by Microgaming software available for Windows download or Flash no download available on other operating systems. The gaming company is licensed and regulated in Malta. The revenue share commission rate starts at 25% and can climb up to 50%. Their current affiliate promotion is 50% revenue share for the first 2 months to try promoting the program. The casino is featured in many languages with payments made by many ewallets including Moneybookers and Neteller. GoWild won a 2011 Gaffg awards for Trusted Affiliate Manager! The partner program recently won the 2011 iGB Affiliate Awards for Best Newcomer Affiliate Program. The affiliate backend displays a welcome message in the members area. There is a quick statistics section for the current month that displays clicks, impressions, new real players, existing wagering players, new and total wagering players plus profit, deductions and net profits. The important sections of the backend are the reports and marketing tools. The 2 main reports are for players and for sub affiliate referrals. The banners section offers animated gifs, jpg, bmp, png files with wmf, swf (flash banners) and text links. The 4 main languages are English, French, German and Italian. Get 50% revenue share commissions for the first 2 months promoting Go Wild Casino. The affiliate program has all the tools you need to promote the casino to your players. The casino doesn't accept players from the United States, Israel, Malta, Serbia, South Africa, France, Denmark, Spain, Italy or Belgium. The languages available at GoWild Casino are English, Dutch, French, German, Italian, Romanian, Russian and Spanish. The program is a recent winner of one of the iGB affiliate awards and is promoted by many top affiliates.